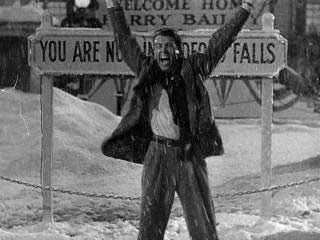 I think one of the hardest situations to deal with is, what I call, the "It's a Wonderful Life" syndrome. That feeling like everyone would be better off without you. But sadly, unlike Jimmy Stewart, we don't have a personal wingless angel who shows us what the world would be like without us. It's so much easier to focus on screw ups — the things we did we aren't proud of, the times we've hurt those close to us. Trust me, I've done my fair share of things I'm not proud of (a list I do not feel like going into detail with right now). Anyone who is human has screwed up. And I know all too well that thought: "Maybe everyone would be better off without me." Sometimes we're forgiven for our mistake; sometimes we lose those close to us who refuse to give their forgiveness. Either way, no matter the screw up, it's not the end of the road. Anyone who has seen "Walk the Line" knows the story of Johnny Cash — a drug addict and perpetual cheater. But, today, that is not what he is remembered for. He is remembered for his success in music, for sobering up, for bringing hope to inmates and for his romance with June Carter. Sure, he could have thought to himself, "I've screwed up too much to come back from now" or "Everyone would be better off without me." But despite the screw-ups, he triumphed over it (and died of natural causes, not of ending his own life). Like the man in black said himself: "I learn from my mistakes. It's a very painful way to learn, but without pain, the old saying is, there's no gain. I found that to be true in my life. You miss a lot of opportunities by making mistakes, but that's part of it: knowing that you're not shut out forever and there's a goal you can reach."